I moved to Grass Valley in 2013 and as a new dentist living in this area, I would like to tell you a little bit about myself. I graduated from University of Chile with highest honors in 1990. I have dedicated my career to cosmetic and family dentistry, oral medicine, children and adults with special needs and I have participated in dental research on preventive strategies while working as a clinical instructor for 10 years in Dental School. Also, I have participated in several dental programs to help the community. After completing all the requirements, I received my California Dental license in 2007. I am a member of the American Dental Association, California Dental Association and Past-President of Butte-Sierra Dental Society. Dentistry has changed so much since I graduated 29 years ago; nowadays, everything is supposed to be done quickly and efficiently, which is understandable, but in my opinion, the quality time spent with my patients, listening to what their needs are, and helping them stay in good oral health, are still the most important principles that guide the way I practice dentistry. I am focused in preventive dentistry because I strongly believe it is the key to achieve good oral health that lasts over time. I think this is a community that will appreciate this kind of approach. 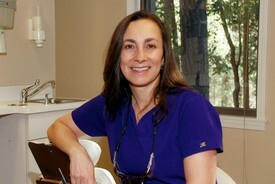 I invite you to visit our office for your dental care, I look forward to meeting each of you.